My Foodie Experience with Estrella Damm’s Tapas Journey. If you know me, you KNOW how much I love to indulge in some delicious, authentic cuisine….all day, errrday. I pretty much never say ‘no’ to food. Mind you, I am a picky eater, but if there’s something I love to eat, you gutta hold me back. 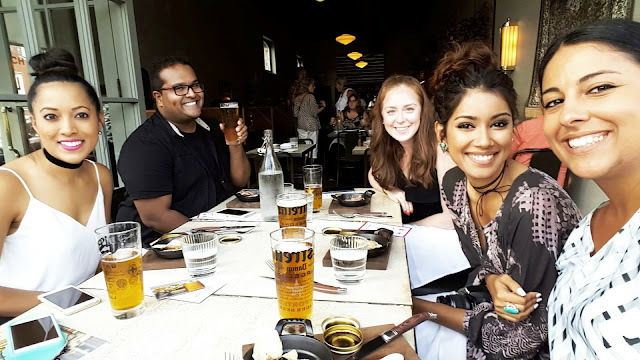 So, naturally when I was invited to the Estrella Damm Tapas Journey, I jumped to the opportunity to dine with some fabulous foodie-friends and sip on some beer. What’s that? Yes, I did say beer. Again, if you know me, beer isn’t my drink of choice. But, when it’s 47 degrees out, and you visit three amazing restaurants, all serving you a cold brew of Estrella Damm, you will drink it, and you will enjoy it. Okay, let me fill you in on what this Tapas Journey is all about. 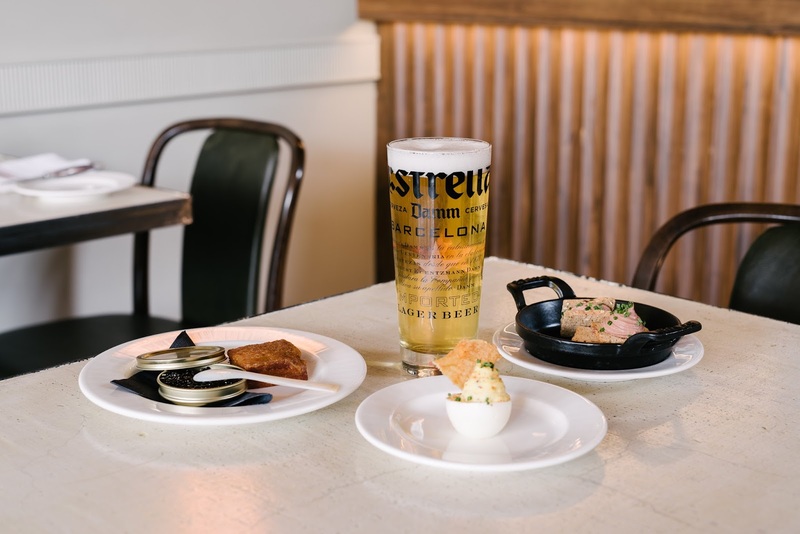 Estrella Damm is partnering with 38 top restaurants across Toronto for this Tapas Journey from Aug 12th – 21st. For $20 you get a plate of three carefully curated Tapas, along with a cold Estrella Damm lager. Tapas are mini plates of deliciousness (a Spanish tradition) and the beer is actually brewed in Barcelona with Mediterranean ingredients since 1876. If you haven’t been to Spain, this is a little taste of the culture for you. One of the things I enjoyed most when I traveled to Barcelona and Madrid, were the tapas. Instead of having a heavy meal at one restaurant, you can pretty much restaurant hop, and enjoy these tapas with a side of cold beer at a few different restaurants. Guys, it was a pretty sweet experience. Before I even begin to talk about how amazing the food was, I have to talk about the actual restaurant and decor of the place. The restaurant is firm in its foundations of British and French principles, with a very clean and modern look. They have these interesting carpets with animal silhouettes that hung on their walls. Chef Noah Goldberg chose three very different yet, delicious tapas for this plate. Mini Welsh Rarebit & Worcestershire Caviar, served with grilled cheese. Devilled Egg, prepared with Mustard and Aruca Spice. All these dishes paired really well with the Estrella Damm beer. I could go for one of those Devilled Eggs right about now! Le Sélect was probably my favourite of the three restaurants we went to. It was SO beautiful and charming, I actually felt like I was sitting at a French Bistro in Paris. The patio, which is where we were seated, had such a Parisian garden vibe, it doesn’t get any cuter! The tapas menu for this one was nothing short of fantastic. Chef Albert Ponzo really knew what I was craving! Fogo Island Cod A La Basquaise served with veggies and white wine. 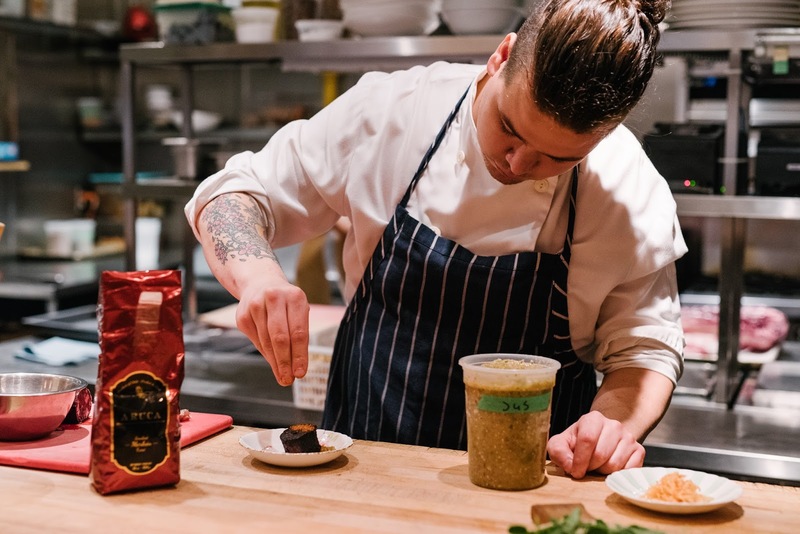 Corn Gazpacho with fermented corn broth and wild and cultivated edibles. Cuba Si Short Ribs with a French Pear Mustard. I have to admit, I’m not a huge fan of red meat, but those short ribs were so tender and delicious, that I devoured them in seconds. Our last and final stop of the evening was Marben. Another beautiful restaurant! Think string lights on the patio (and indoors), wooden tables, rustic vibes, etc. Just SO on brand. 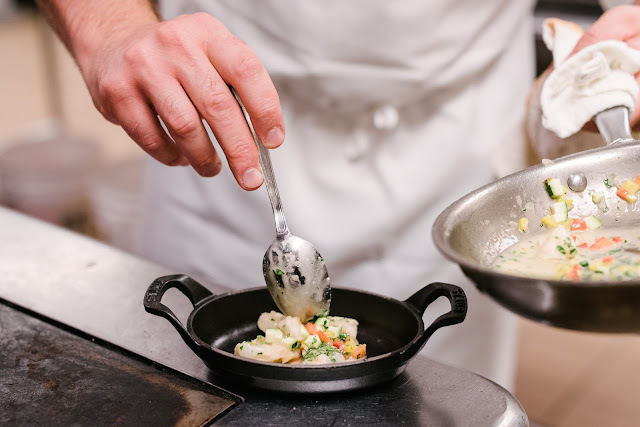 Their tapas menu, by Chef Cody Wilkes is for the adventurous. Braised Octopus, served on a Tostada with cabbage and lime. Potato Croquette, served with Bechamel, crispy speck, and garlic Aioli. Morcillia, which is a blood sausage with smoked Merken. Again, not a HUGE fan of octopus or sausage, but overall quite the menu! If this is your thing, go for it, as I’ve heard only GREAT things about it. After the third restaurant, we were stuffed! Overall the Tapas Journey is something to experience. The experience is supposed to be cultural and fun, and it was exactly that! I invite all of you to experience that! 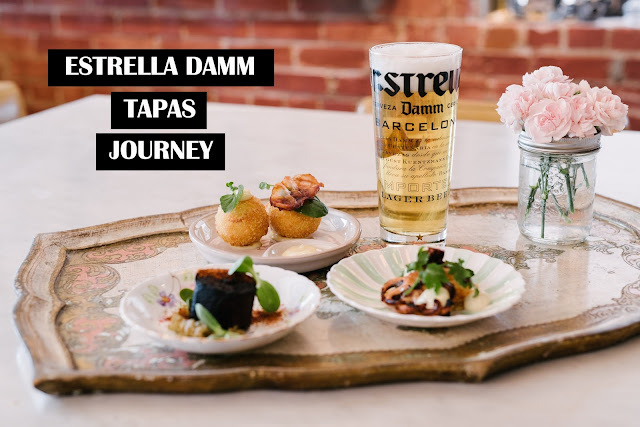 More details on the Estrella Damm Tapas Journey, here. If you guys have any questions about the tour, feel free to ask me. & thanks to Branding & Buzzing for the opportunity! Previous Post Life Lately: The Home Edition. Next Post Whites & Stripes + Discussing Snapchat Vs. Insta-Snap.